Please fill in your details, and we will contact you as soon as possible. Angelos Xekalos +30.2831055606 +30.6979791322 villa@xekalos.com Emm. Pachla 122, Rethymno, 74100. Villa Emmanuel & Villa Bessie are not yet available for rent. The island of Crete is an extremely popular area, visited by lots of tourists every year who want to enjoy the long beaches, scenic landscapes and mountainous villages. Rethymno, in particular, is an area of great historical importance and natural beauty, with many places worth to visit during your holidays in Crete. Rethymno, Crete's smallest prefecture located between White Mountains and Mt Psilorítis, is synonymous to Feel the essence of Mythical Crete in this mountainous, remote and self-sufficient region of the island of Crete. Crete was first inhabited in the prehistoric times. The island developed a marvelous civilization in the Bronze Age under the Minoans. In fact, with Minoan civilization, Crete became the first centre of advanced civilization in Europe. Many towns were constructed, including Knossos palace, Phaestos palace, Zakros palace and others, with impressive buildings, sewage systems and rich decorations. The Minoan civilization was destroyed by the eruption of Thera (Santorini) in about 1,650 BC. Later on, Crete was overrun by the Mycenaean civilization from mainland Greece and gradually declined till the Roman times, when Gortyn was made the capital of the island and Crete became a Roman province. In the Byzantine times, Crete was frequently attacked by pirates and for a period of about 150 years (820-961 AD) it was conquered by Arabs. After several attempts from Eleftherios Venizelos, a local politician and later prime minister of Greece, the island was joined in union with Greece on December 1st, 1943. During World War II, the island was the field of the famous Battle of Crete in May 1941, when local resistant forces and the British Commonwealth force were fighting the Nazi invasion. The German troops eventually managed to conquer Crete with paratroopers, however the island was made a base for desistance forces to escape in Egypt. But the allure of Crete is not founded only on its past. The present is bursting with pleasures to entice young and old alike. The physical beauty of the island is quite stunning. Within its relatively small area it contains a remarkable variety of landscapes, such as the clear turquoise of the sea, the verdant agricultural plains, the deep, narrow chasms of the gorges, the high rocky (and, in some seasons, snowy) mountains. Whether you prefer to travel on foot, by mountain bike, by car or by coach, you will be sure to be filled with awe and delight as you explore the island. Just think of the photographs you will take! If you’re a foodie, you will be in heaven during your Crete Greece holidays, where ‘locavore’ is not a trend but a way of life. Rural taverns often produce their own meat, cheese, olive oil, raki and wine, and catch their own seafood. Follow a gourmet trail across the landscape and you’ll delight in distinctive herbs and greens gathered from each hillside, cheeses made fresh with unique village- or household-specific recipes, and honey flavoured by mountain herbs. The Cretan diet is among the healthiest in the world. Pair your meal with excellent local wine, and cap it off with a fiery shot of raki. Crete is among the most popular holiday destinations in Greece. It has four prefectures: Chania, Rethymno, Heraklion, Lassithi, although most tourists distinguish the island in western and eastern Crete. There are noumerous tourist organized places in Crete which offer many hotels and accommodation. However, a drive around the island will bring you to wonderful little places and villages, amazing nature and virgin beaches. Rethymno is one of the most promising destinations for you Crete Greece holidays. Despite being the smallest prefecture of Crete, Rethymno is a magnificent tourist destination, ideal for Crete Greece holidays. It is famous for its natural beauties and its infrastructures. Located between the mountains Lefka Ori and the famous mountain named Psiloritis (also called “Ídi”), Rethymno is synonymous to gorgeous mountainscapes, marvellous beaches, Cretan lyre melodies, traditional food and drinks, legendary caves, historic monasteries and monuments, traditional mountain villages and luxurious holiday resorts, making it the perfect destination for your holidays in Crete. Rethymnon has retained more evidence of the Venetian and Turkish eras than the other cities of Crete, partly because it was not bombed as heavily during World War II. It is a wonderful mixture of old and new combining the historic old town with a dynamic, commercial centre. It’s Venetian-Ottoman quarter occupies the headland beneath the massive Venetian fortress (fortezza) guarding the harbour. This area has lots of interesting small shops, tavernas and restaurants. The area around Rethymnon has some of the most dramatic scenery in Northern Crete. The coastline is a mixture of long sandy beaches that give way to isolated coves, some of which are only accessible by boat. The villages of the hilly interior are home to some of Crete’s most outstanding crafts, including the pottery at Margarites and the textiles at Anogia. 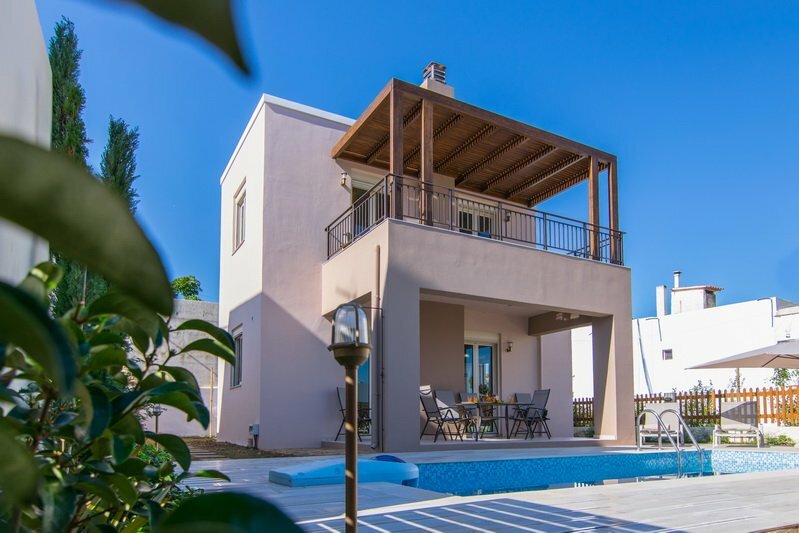 Rethymnon is ideally placed for ease of access as it is approximately mid way between the international airports at Heraklion and Chania, both of which are about an hour away. There are daily car ferries to and from Athens making it easily accessible for anyone who desires holidays in Crete. The way from Rethymno City to south beaches it will not last more than 45 minutes. Visitors can walk along petrous canyons, find sandy beaches with crystal-clear waters and visit archaeologic places. They also have the opportunity to see and admire many traditional cretan villages. Yet, there is still the city centre they ought to pay a visit to. Today's old town, which is one of the best preserved old towns in Crete, is almost entirely built by Venetians. Unaffected by the traditional Cretan taverns and the numerous shops – ideal for your shopping- the old town preserved its old aristocratic appearance, with its buildings dating from the 16th century, arched doorways, stone staircases, Byzantine and Hellenic-Roman remains, small Venetian harbour and narrow streets. The big municipal gardens are also ideal for those in search of shade and tranquillity and if you happen to visit Rethymno at the beginning of July you can enjoy the annual Wine Festival, which attracts a large crowd privileged to indulge themselves with traditional Cretan tastes and sounds. The visitor of Rethymno can also see the famous Venetian castle called the Fortetza, which is one of the biggest and best standing castles in Crete. Other monuments include the Neratze mosque (St. Katherine's Catholic Church), the Great Gate (megali porta, Porta Guerra), the Piazza Rimondi (Rimmondi square), the Venetian Loggia etc. This is the Rethymno we offer you as the ultimate choice for your Crete Greece holidays awaiting you to discover traces of a civilisation that dates back 4,500 years, numerous Byzantine churches and monasteries, enchanting Venetian monuments, the most well-preserved Renaissance city in Greece, with endless beaches, caves, gorges and unique flora and fauna.